Dryness is being equated with wrinkles. And while we accept the fact that wrinkles is part of human aging, we want to delay it as much as possible! Due to the scenarios above, we need to find a weapon! And a beautiful, whitening weapon we have here! Unveil the curtain and let's see how AVON SKIN SO SOFT (SSS) GLUTATHIONE LOTION will save us on our summery days. A handy lotion is just right to fit into my kikay kit. Good thing a 50 ml bottle is available. Perfect for everyday use and of course, one thing I love doing over and over. Eating? NO! Traveling. YES! ☺. try slathering some on one hand and compare it on your other hand. ☺Staying power. Like make-ups, lotions have staying power too! Avon's SSS stood the test of time (literally). ☻The smell. Don't get me wrong. Lotion exhibits a good smell. Maybe, it's just me that's not a fan of sweet flowery sniffs. 'inside job' rather than outside, topical regimen. However, the gluta promise comes as a bonus after all. Australian Vitamin E Skin Repair Cream. Guess what's the latest addition on my 2013 Summer Kit? Hi ate. I was wondering if you happen to know any whitening products for elbows and knees, or any treatments perhaps? Thankyou. Hi Christine. Block and White Products are okay too. 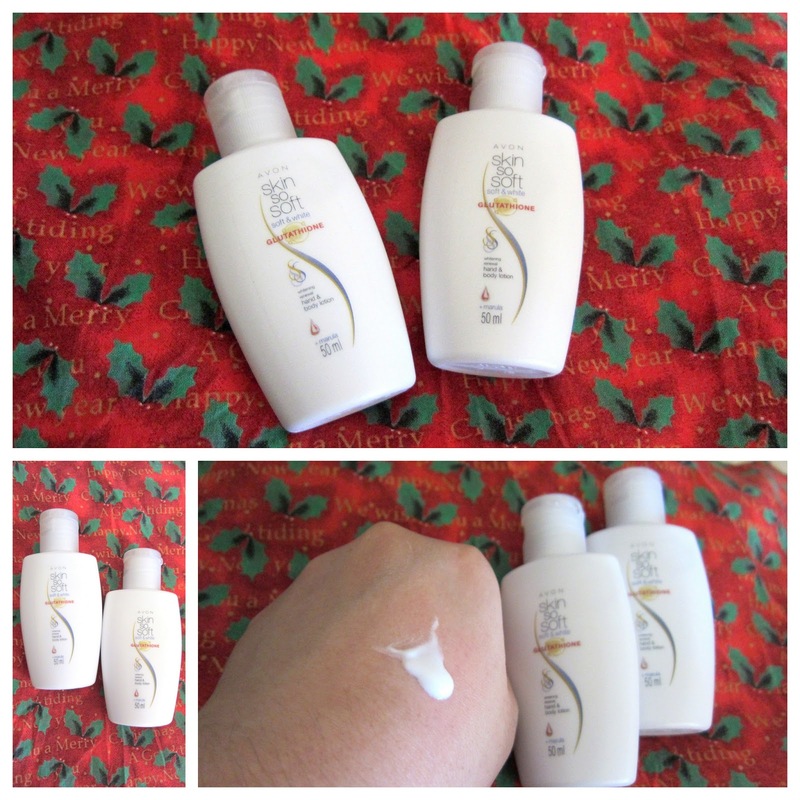 Avon lotions with gluta element is worth a try as well :) And of course, Belo products. Ive never purchased nor tried belo products before, are they affordable? Hi! Glamourbox also had this items on their March 2013 box. I am not a fan of Avon products but I agree with you on this one. :) This is in my summer getaway kit as well. It's just sad that the whitening effects will not take effect any time soon. I guess I should buy the whole bottle for visible results.